Ten-year-old Azniv Basralian wanted to do something special for those less fortunate this Christmas season and she asked her Sunday School class to join her. 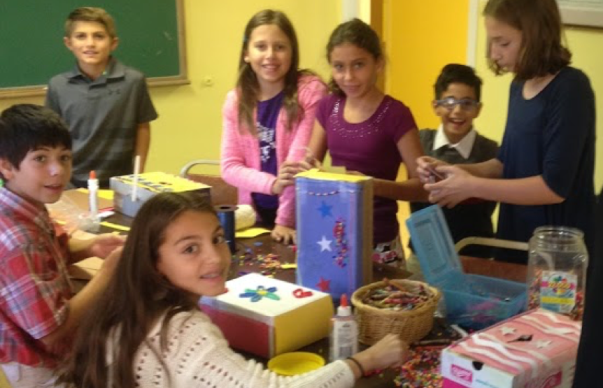 Azniv’s father, Joseph Basralian, who teaches a fifth and sixth grade class at St. Mary’s Armenian Apostolic Church in Livingston, New Jersey, suggested having a bake sale with proceeds going to Armenian organizations — one of which would be the Armenian EyeCare Project. The class was thrilled with the idea and Azniv and her classmates got to work right away. With a table topped with culinary delights — everything from cookies and pies to savory dips and creamy soups — the Sunday School class placed a donation box next to each food item. People attending the bake sale were asked to place a donation in the box next to their favorite food. When asking Azniv why she chose the Armenian EyeCare Project as one of the organizations to support, she said she realized how important it is to give people in Armenia the opportunity to receive eye care just like she does. “I have to wear glasses that I need for close-up reading and before I got them I didn’t understand why it was hard to read and never really knew what the problem was,” Azniv said. “Then, I got my glasses and I realized how important it was for people in Armenia to be able to get eyeglasses if they needed them. 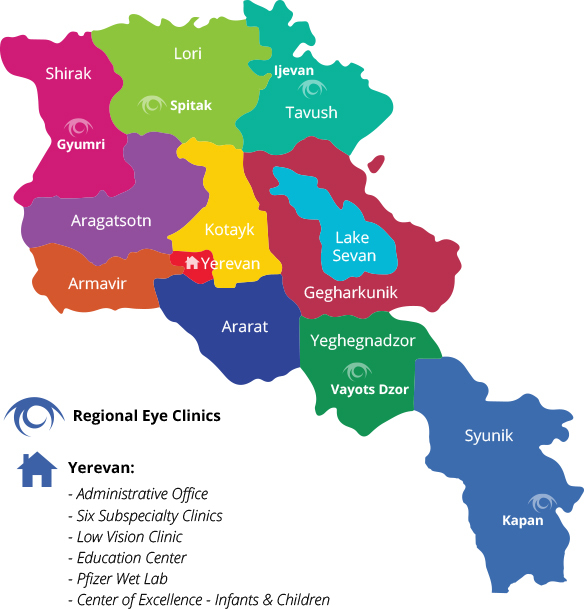 I think everyone should have a chance to get eye care if they need it.” The EyeCare Project has provided more than 70,000 pairs of eyeglasses to children and adults in need in Armenia at no cost. 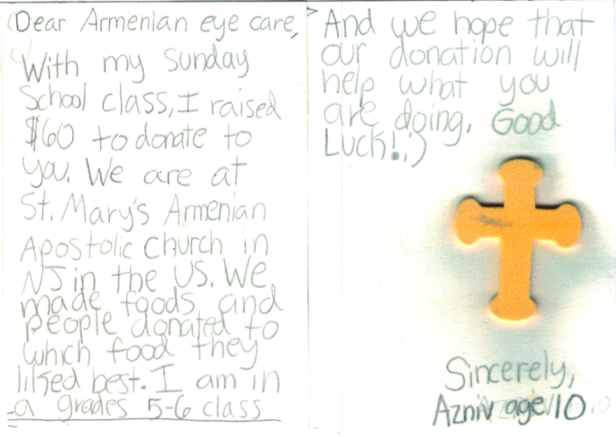 When Azniv’s and her classmates’ donation — along with Azniv’s letter — arrived, the Armenian EyeCare Project was touched by the sweet gesture from this very special Sunday School class. After receiving the donation, we reached out to Azniv and thanked her for her Sunday School’s generous donation, adding that it made us feel very happy that her class thought of the EyeCare Project and the many people in Armenia who are in desperate need of eye care. Azniv and her classmates are wonderful examples of young people who understand the importance of helping those less fortunate. It is most impressive that at such a young age they have incorporated the values of reaching out to those in need of a helping hand and of caring and sharing, understanding that their work sustains communities and enables people — regardless of their economic status or the adversities they face — to grow and succeed.